We’re looking at a family home full of Southern charm in a coastal New Jersey town. Sitting in a traditional neighbourhood, the area is steeped in Americana. This 2,600 square foot home was a tight fit between two older homes. 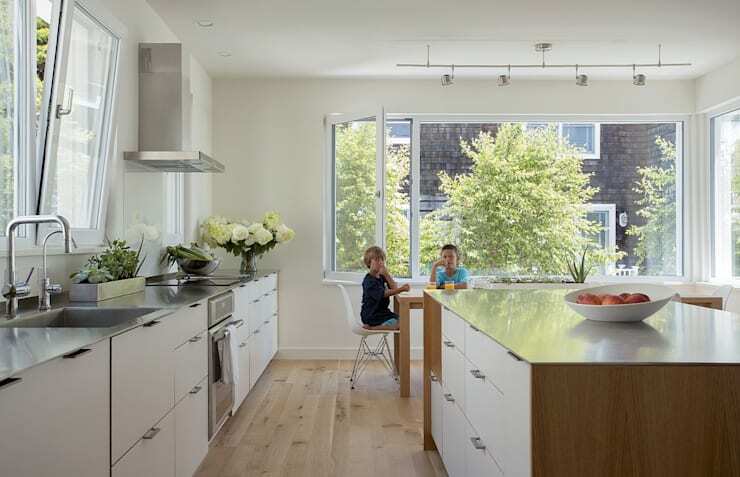 The architects at Zeroenergy design maximized opportunities for light and space all on a small footprint. Energy efficiency is key to this project and the home consumes a shockingly low amount. It uses 15% of the energy of a comparable home!The home produces enough energy to meet 60% of its demand. 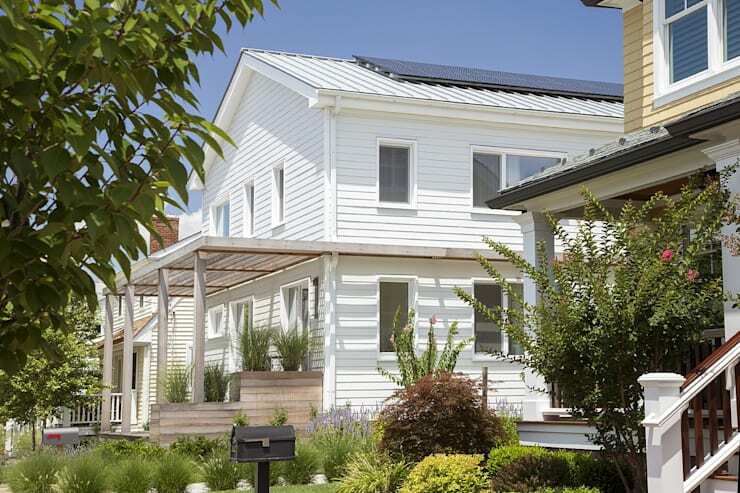 Zeroenergy achieved multiple green home certifications for the project. Inside, we’ll find fresh modern interiors designed for a large family. Functional storage solutions minimize clutter. Open and bright floorplans put livability at the centre of the design. Let’s start our of this eco-friendly family home! The neighbourhood has a rich variety of traditional homes. The understated white exterior helps the home blend right into the block. Except, check out the solar panels on the roof! Those solar panels help the home to produce its own energy. Another innovative green feature of the home is its rainwater collection system. Water collects off the roof and is stored in cisterns to use in the garden and landscaping. Since the home is close to the beach, they installed an outdoor shower by the garage. It's a helpful feature that cuts down on the amount of sand that gets inside. This porch combines Southern-style with a modern edge. A reclaimed wood trellis wraps the home. It shades the deck and a few south-facing windows to keep things cool in the summer. The porch is custom designed to mediate the change in elevation between the ground and the first floor of the home. 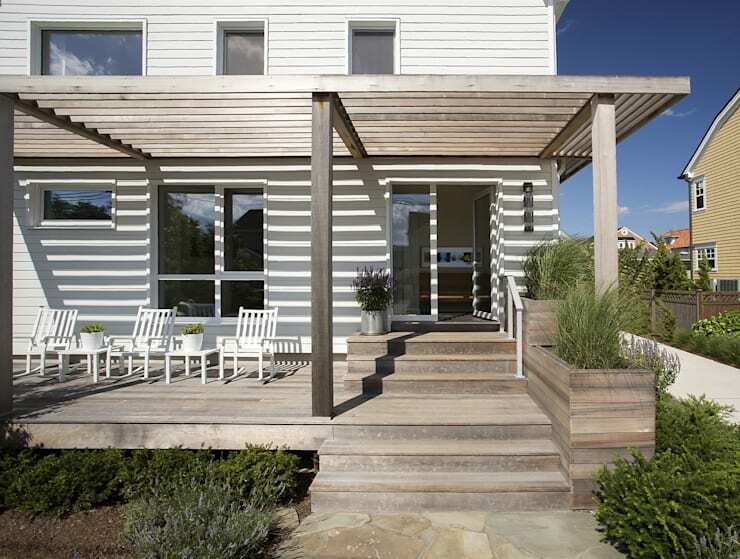 No handrails create an open and free sensation so that it’s easy to relax on this clean and minimalist porch. The change in elevation is deliberate. The first floor of the home is lifted four feet above grade to minimize flood risk. Hurricane resistant window shutters are artfully incorporated into the trim. The energy efficient triple-glazed windows are protected during a storm from flying debris. The home is beautiful and strong! Bright white interiors and high ceilings in the open plan kitchen, living, and dining space make the home feel larger. The soft wood floors bring a matte finish to the style. Cream coloured furniture with black accents from the chairs around the kitchen Island creates a neutral colour pallet. The result is a space that's casual and low-maintenance. There's a delightful effortless feeling to the home that's so essential for the chaos of family life. Negative fixtures on white cabinets create an instant minimalist look in the kitchen. Plentiful storage means that the counters are bare except for plants and a fresh fruit bowl. 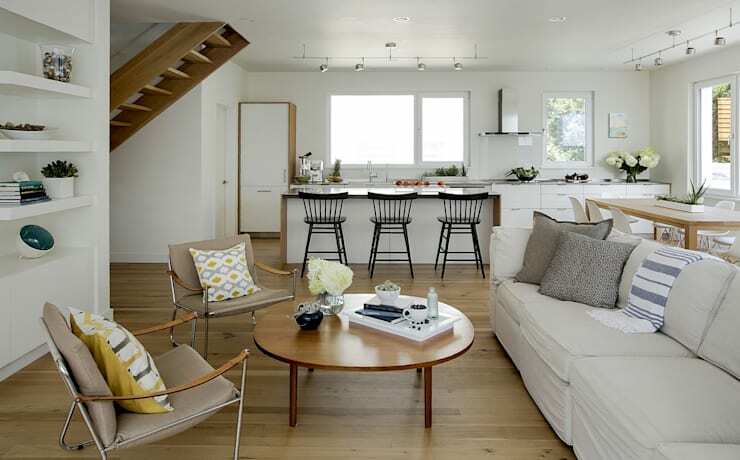 The clean Scandinavian look of this space is ideal for a family because it's easy to maintain and take care of! No frills means no worries when someone inevitably spills, breaks, or rips something. This dining space proves that you never have to give up style in your family home. On trend dining tables with steel legs surround a modest wood dining table. The look is at once bold and understated because of the lack of clutter and surplus of space. There's often an impulse to fill up a room. By resisting the urge and letting a room be open and empty you can create a luxurious sense of openness. A track lighting fixture takes up next to no space to keep the space feeling large and airy. Massive picture windows in the dining space bring in light and create a beautiful view of trees and the neighbour's character home. We hope you enjoyed our tour of this fabulous family home! For more green home inspiration check out our feature on an eco-friendly boho chic home. What did you love about this charming home?